HomeNo Need for Black Friday! I love living, literally, down the street from Benny’s Store. For those of you who don’t live in Rhode Island, or nearby Connecticut and Massachusetts border towns, you will not recognize the name. Rhode Islanders know the store, which opened here in Providence in 1924, as a neighborhood fixture in many towns. According to the information you can find on-line, the store began as an automotive supply and hardware store. It’s changed over the years and while you can still buy tires and have them mounted at the store, you can also find SO much other stuff there. Case in point, I went Christmas shopping there this morning for gifts for my grandchildren. Toys and games were anywhere from 30 to 50% off, a great sale for sure, but toys there are always a much lower price than anywhere else I shop. As I entered the store I was promptly greeted and asked if I would be interested in the layaway program for my purchases. While my answer was “no, thank you” to the employee, it reminded me of how many times my mother used the [again] popular way of ensuring there was plenty to open on Christmas morning. The practice of paying for things a bit at a time before bringing them home, according to the magical internet, was popularized during the Great Depression and lasted as a common practice well into the 1980’s. As a kid I didn’t understand the value of layaway for a family as big as ours, but many a winter coat and bicycle (among other things) was bought as a result of first being on layaway. I am thrilled it’s made a comeback! Benny’s has never stopped offering layaway; and if our grandchildren were still living with us, I bet I’d have bikes on layaway at this point. I walked away this morning well within my budget with Legos, board games, art supplies, Crayola crayon sets, and puzzles; enough for each child to have at least five wrapped gifts that will be sent FedEx in a week or so. 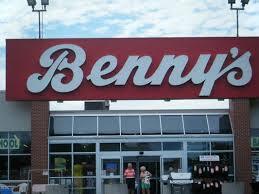 Black Friday…no need for such things when you live in Rhode Island and better yet, near a Benny’s. Thanks, Benny’s! !